for the dates you want. Popular 4 bedroom villa with Pool near Pula. 3 bedroom villa with pool in stunning bay between Split/Zadar. 2 bedroom Brac island apartment with Milna Harbour views. Stunning waterfront villa near Primosten, sleeps 6. 2 bedroom apartment overlooking Dubrovnik’s most popular beach. 3 bedroom villa in Cavtat’s atmospheric old town. 5 bedroom luxury Istrian villa with pool. Set in a vineyard, Hvar island villa with stunning views sleeps 10. 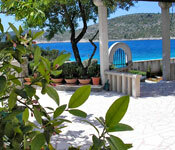 2 bedroom villa with pool in pretty coastal village near Trogir. Book your 2012 dates now and take advantage of our early booking offers across a selection of fabulous Villas and Apartments!